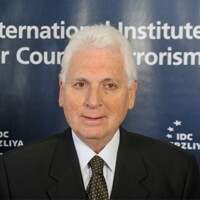 Ambassador Itzhak Levanon is an associate, International Institute for Counter-Terrorism (ICT), Interdisciplinary Center (IDC), Herzliya, Israel. Mr. Levanon served as Ambassador Extraordinary and Plenipotentiary for the State of Israel to the Arab Republic of Egypt from 2009-2011. Mr. Levanon first entered the field of public service in Jerusalem in 1969 as an assistant for Arab Affairs to Jerusalem Mayor Teddy Kollek. He joined the Israeli Ministry of Foreign Affairs in 1972 and served in various positions to the United Nations, Venezuela, Colombia, France and Canada. In 1994 he was a member of the Israeli delegation at the peace talks in Washington D.C. following the Madrid Conference for Peace in the Middle East. In 1994 he was appointed Consul General of Israel to New England; a position he held until 2002. Upon his return to Israel, Ambassador Levanon was promoted to the position of Ambassador Extraordinary and Plenipotentiary to the United Nations in Geneva. Subsequently, he became spokesperson of the Ministry of Foreign Affairs to the Arab World. Itzhak Levanon studied at the Hebrew University of Jerusalem, McGill University and the American University of Beirut and hold Certificates of Honor from, among others, Massachusetts Congress, Rhode Island Congress, B’nai Brith International, Hadassah International and the Friends of the Technion.